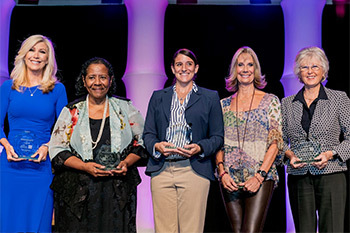 Dr. Gloria McNeal, Dean of the School of Health and Human Services at National University, has been honored by the San Diego Business Journal with its 2016 Women Who Mean Business Award spotlighting leaders who are breaking new ground in contributing to their profession and to their community. Dr. McNeal received the award at a November 9 luncheon in San Diego. As Dean of National University’s School of Health and Human Services, Dr. Gloria McNeal is an innovator who is changing not only how health care is delivered, but also how it is taught. She was pivotal in securing a $1.5 million federal grant to launch National University’s Nurse-Managed Clinic in the Los Angeles community of Watts, a project that could become the model for the rest of the nation by making health care more accessible to residents through the use of cutting-edge telehealth technologies. Dr. McNeal also played a critical role in guiding an innovative collaboration involving National University and Planetree, Inc., a nonprofit that partners with healthcare organizations around the world, including in San Diego. The partnership is first of its kind with an educational institution to infuse curriculum with patient-centered heath care principles, which emphasize the active participation of patients and their families in the decision-making process. Additionally during Dr. McNeal’s leadership, in support of the groundwork laid by Dr Tyler Smith, Chair of the Department of Community Health and Ms. Christy Schumacher, Internship Director, National University launched a partnership with a Scripps Health-affiliated physicians’ group to create a new online resource connecting more than 650 medical practices with graduate students in the programs of Master of Healthcare Administration, Master of Public Health, Master of Health and Life Science Analytics, and Master of Health Informatics. In response to the call to prepare corpsmen and medics to earn the BSN credential, she secured a $1 million federal grant to initiate the University’s Vets to BSN program, which creates an accelerated pathway for active duty and veterans interested in nursing careers. Dr. McNeal’s leadership skills come from years of experience serving her community and country as a nurse, a Naval officer, and as an educator. Her focus – both academically and personally – has long been on supporting equitable access of preventive and primary care health services to the poor and increasing diversity in the nursing workforce. Dr. McNeal has held management positions for Keystone Mercy Health Plan and the MercyCARE Mobile Health Programs in Pennsylvania, and held faculty positions at Rutgers University, the University of Pennsylvania, and Thomas Jefferson University before being named Assistant and Associate Dean of the School of Nursing at the University of Medicine and Dentistry of New Jersey. Prior to joining National University, Dr. McNeal served as the Founding Dean of the Mervyn M. Dymally School of Nursing at Charles R. Drew University of Medicine and Science in Los Angeles. She is a Fellow of the prestigious American Academy of Nursing, and held a three-year fellowship in the Robert Wood Johnson Foundation Executive Nurse Fellows program. 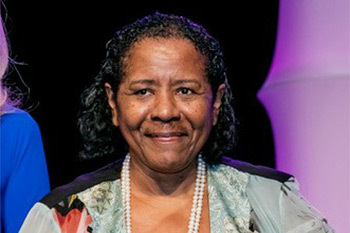 A prolific writer, she is the author of over 140 articles, books, book chapters, abstracts and editorials, is the immediate past Editor of the ABNF Journal, the official publication of the Association of Black Nursing Faculty, Inc, and an Associate Editor of the Core Curriculum for Transcultural Nursing and Healthcare.